Patti LuPone and Debra Winger (in her Broadway debut) are very much at the top of their game in David Mamet’s mercifully short (70 minutes) play charting the meeting of Cathy (LuPone), a prisoner convicted of murder during a politically-motivated bank robbery, and Ann (Winger), her jailor of the past 35 years. The conversation -- I might say confrontation but that would suggest a sense of drama sadly missing here -- revolves around Cathy trying to convince Ann that she deserves her freedom for good behavior, and that she poses no threat to society, particularly as her crime was not ultimately judged politically motivated. Ann reminds her that the families of the two policemen who were killed that day want to keep her in there, and she continues to be skeptical of Cathy’s avowed conversion to Christianity and breaking with her old cronies, including a woman who apparently had been Cathy’s girlfriend. There is the implication that Ann is about to be transferred, and this may be Cathy’s last chance to win her over. 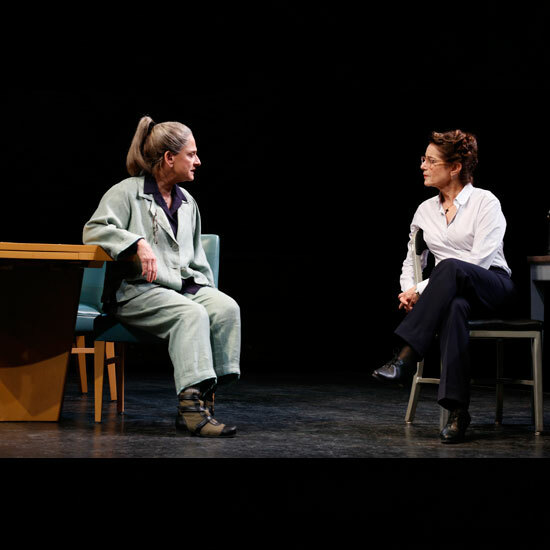 Both actresses deliver Mamet’s dense and tricky script with dexterity. LuPone has the longest passages, which she handles beautifully, reminding us again what a fine dramatic actress she is. Winger’s demeanor is something akin to Lorraine Bracco’s psychiatrist’s cool, dispassionate probing of Tony Soprano, and she, too, is solidly assured. The basic argument is reasonably interesting, of course, but it can’t be said that Mamet succeeds in creating the requisite dramatic tension, or making the central argument sufficiently provocative and intriguing. The question of Cathy winning her freedom takes second place to the intellectual argument. Thus, the chief pleasure is to be found in watching these two pros hit Mamet’s exchanges back and forth as adeptly as they do, under the directorial guidance of Mamet himself. Much as one may admire that talent on stage, and the skill of Mamet’s writing (and indeed, the writing is never less than intelligent and the meat of the discourse is intermittently interesting), “The Anarchist” demands too much of its audience, and much as one may decry the paucity of serious theater on Broadway these days, the work would – in hindsight -- have been far more sensibly mounted Off-Broadway. Set designer Patrizia Von Brandenstein (who also created LuPone’s drab prison attire and Winger’s tailored suit) has created a good playing field for the discourse, as lighted by Jeff Croiter.